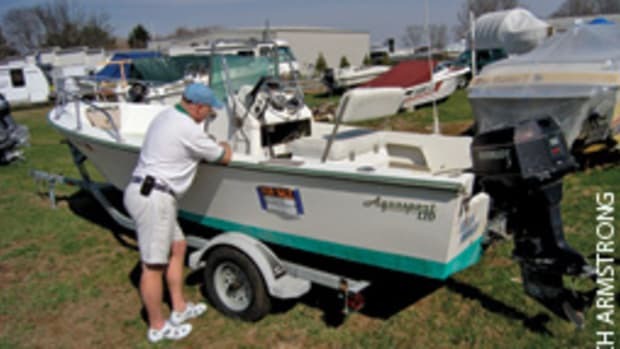 A trailer is often “thrown in” when you’re buying a small used boat from an individual. But if it’s not roadworthy, you may not get to use the boat at all. The trailer has to be suitable for its intended use. You can be more forgiving if you intend to trailer once or twice annually, traveling a short distance to and from your slip and not at highway speeds. A trip from New England to Florida with a twin-engine cuddy cabin is another story. • The trailer must be designed for the size, configuration and weight of the boat. The boatbuilder can spell out what a particular model requires, and the trailer manufacturer can tell you if the trailer meets those needs. The boat shouldn’t overhang the rear of the trailer because this won’t provide adequate support. 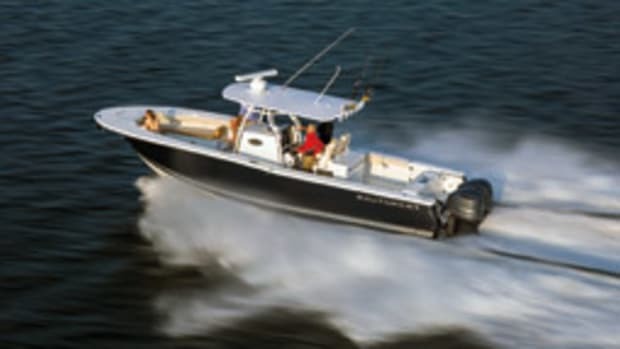 The transom is carrying the weight of the outboard — raised for ground clearance. 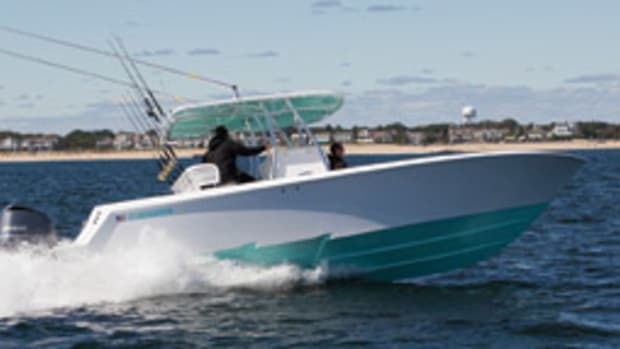 Without support, it will be trying to rip the transom away from the hull with every bump in the road. • Rollers, if the trailer is so equipped, should be round, not flattened where the boat rests. There should be no cracks in the rollers, and certainly none should be missing. 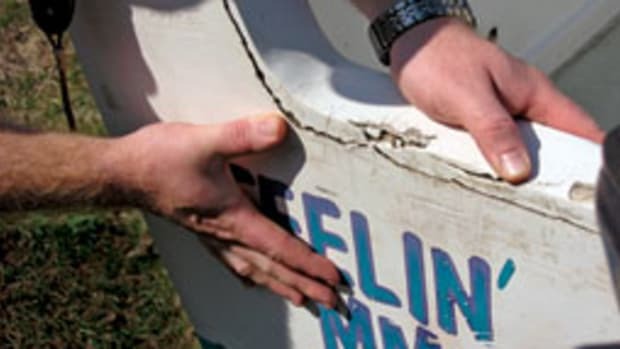 Damaged rollers won’t properly support the boat and can drag and damage the hull. The roller support arms should not be bent. • On trailers equipped with bunks, be certain the carpet covering is in good condition and the edges on the bunks are smooth. Bunks should be through-bolted to their supports because lag bolts eventually will loosen and fall out. The bunk will fall away, and your boat will be left supported by sharp metal brackets. • Check at the frame, rails and cross members for rust, corrosion and signs of fatigue, such as bent or twisted structures. Rusty surfaces need to be closely inspected to determine how deep into the steel the rust has penetrated. • If the trailer is equipped with torsion axles, carefully inspect the bolts that attach the axles to the frame rails. If there is any sign of rust or corrosion, have the bolts removed, the frame inspected and new hardware installed. On trailers with leaf springs, inspect the springs, shackles, pivot bolts and equalizers for the same issues. • Tires typically suffer dry rot and flat spots long before they wear out. Inspect the sidewalls for cracking, and make sure the tires fall within the proper load range. Tire covers are the best protection against UV deterioration. • A grease coating on the inboard sides of wheels is caused by leaking inner bearing seals. This problem allows hot grease to escape and sea water to seep into the hub when the wheels are submerged. • Bearing protectors should be fitted to the hubs. They are inexpensive, easy to install and highly recommended if you intend to submerge the trailer hubs. • The winch post typically is viewed as the place to mount the winch, nothing more. 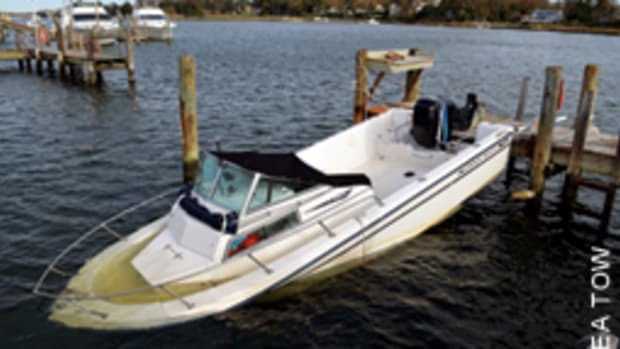 But in a collision or sudden stop it could be the only thing that keeps the boat from becoming part of the tow vehicle. The winch post should be well-designed, securely attached to the trailer tongue and reinforced for the loads it may be required to handle. 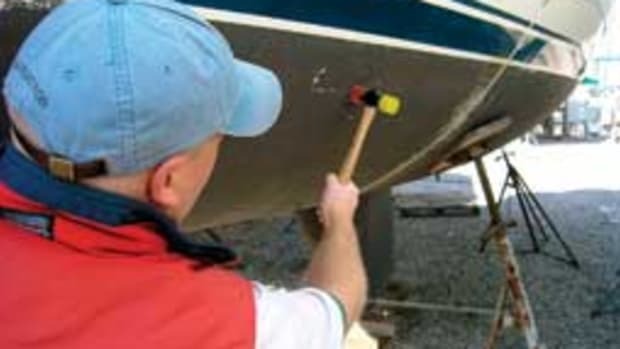 The bow roller or stop should be adjusted so it’s above the boat’s bow eye, further working to keep the boat down on the trailer. 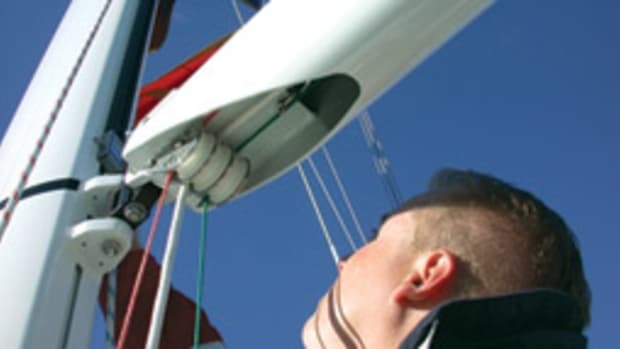 • Winch cable needs to lie flat across the winch drum and should be regularly inspected for signs of fraying, corrosion or kinking. I prefer a winch strap to a cable from maintenance, safety and convenience standpoints. • Brake lines should be either stainless steel with stainless steel fittings or the newer Department of Transportation-approved flexible hoses. • On trailers with hydraulic surge brakes, it is important to return the brake coupler to the towing position before disconnecting the trailer from the vehicle. When the cast iron master cylinder is left with pressure applied to the brakes (as when backing uphill), part of the interior of the master cylinder is exposed, allowing corrosion to form and contaminate the hydraulic fluid. • Trailer electrics always seem to create issues, but they certainly don’t have to. 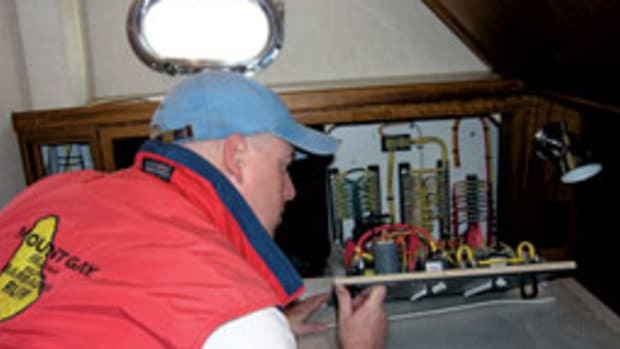 If you want reliable lights, install the new sealed LEDs, using waterproof connections and marine grade wire. Run a dedicated ground wire from the trailer to your tow vehicle rather than use the tow ball as the ground. The money spent initially will save you over the long haul.